Rationalist Judaism: Who Flocks to Yosef Mizrachi? Who Flocks to Yosef Mizrachi? Yet his delirious joy is based on something that never happened! 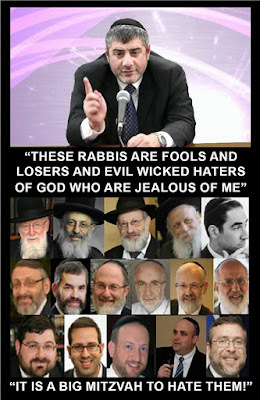 I did not write any post at all in defense of Rabbi Dweck during the controversy over his teachings. That was for the simple reason that, as I stated explicitly, I had not heard any of Rabbi Dweck’s lectures and could not comment on them. So Mizrachi’s argument is a complete fabrication! 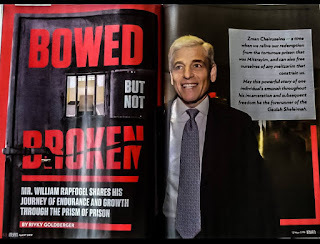 What I think he has in mind is that several months before the Rabbi Dweck controversy, I wrote two posts to defend the honor of the sixteen rabbis that Mizrachi trashed (with ridiculous lies and insults) after they criticized his crass and perverse teachings. I knew many of them, and I condemned Mizrachi’s slander of them, and explained why their critique of his teachings was entirely justified. I added that I didn’t know Rabbi Dweck (one of the sixteen that Mizrachi slandered with particular venom), but that in light of his outstanding biographical information, it seemed unlikely that Mizrachi was correct in describing him as a “wicked monster” who is “the biggest enemy of the Jewish nation.” But the post was as a defense of the letter of the 16 rabbanim, several of whom are my personal friends. It was they to whom I flocked. So Mizrachi’s entire point is a non-starter, unless he wants to claim that I am of the same kind as the 16 rabbis! The Gemara’s point about starlings going to ravens isn’t illustrated by the fabrication that Mizrachi creates. But if you want an illustration of the Gemara’s principle, there would seem to be a great example: that of Yosef Mizrachi. Who flocks to Mizrachi’s classes? I know one very fine person who is, inexplicably, besotted with him. But many of his most devoted followers, those who flock to defend him, seem to be of poor character – hateful people, willfully ignorant people, crass people, violent people, people who gloat at the suffering of others. And here’s the ultimate kicker: Mizrachi himself has boasted of criminals and murderers who are followers of his! He once proudly described how he has a devoted follower who wanted to actually murder one of his critics! Lo lechinam holech ha-zarzir etzel ha-orev, elah mipnei shehu mino. It is VERY difficult to say that you are not doing "lashon harraa" in some way! Mizrachi is a dangerous man, who preaches hate and divisiveness. There is certainly no issue calling him out. Just because you wouldn't call out someone who slandered you doesn't mean RNS has to be quiet when he is a victim of slander. Open your Chafetz Chaim and learn the halacha. This post is not about Rabbi Dweck. This post points out that Yosef Mizrachi is internally inconsistent. Never did RNS say that he agrees with the birds of a feather principle. ...I suggest you listen yourself and make up your mind. (b) Mizrachi (I will not dignify him with the title Rabbi) is at best, an idiot who by his own admission has limited comprehension of English, or at worst, is a disingenuous liar who deliberately misrepresented what Dweck said. I'm a big fan of this blog and it's author and his work, from whom I've learned many things. I've also been inspired to pursue my own interests in learning Torah. That having been said, I think there is more than enough material from Mizrachi to criticize without having to get into anything about his "followers." Mizrachi is so beyond the pale, I sometimes wonder if we ought to respond to him at all. WHy not debate Rabbi Mizrachi? He loves debates! how about we just learn Torah without name-calling? This is the kind of think that Mizrachi would say about others. Let's not commit the same fallacy, IMO. Here is an easier explanation: an element of popular religion is team selection: here are the good guys (our team); over there are the bad guys (other team). Add in that a lot of religious conviction revolves around finding the easy or magical solution to your problems (e.g. segulos), and it is easy to understand why someone like Mizrachi can appeal to both elements. You generally are appealing to a view of religion as a (sometimes mundane) source of help in the struggle of everyday life. This view was not appealing to large numbers of people in the Rambam's day and it is probably no more appealing today. This will kill my comment for lots of people, but I think that a similar analysis applies to the Trump phenomena in the US. I'll refer you to a discussion I myself had with his followers on a video concerning Dweck, Mizrachi and Mansour. So then how can anyone think it would be okay for 2 adult men to sleep in the same bed. What has this got to do with the lecture? R Dweck described the men kissing and caressing in a nonsexual manner. That is not the same as sleeping in the same bed. This is really sad. 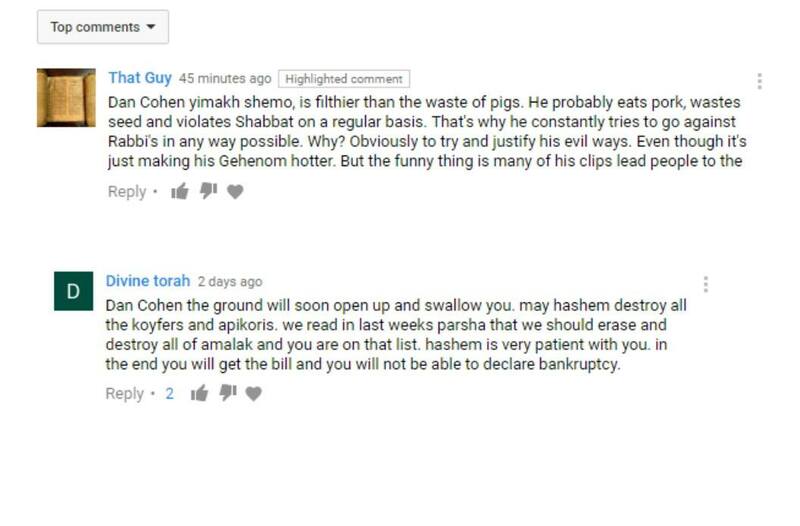 The first thing I did when I saw your rude idiotic response was check to see if you are a Youtube follower of that rude, idiotic Yosef Mizrachi. Surprise surprise, you are! His response to Dweck in this video is so foolish he either didn't listen, didn't understand..... or is a liar. Now, re-read what I have written and try again with an adult response. There are annoying people everywhere. And the few people who you argue with are not a random sample of his supporters. Finally, I think that pretty high percentage of Orthodox have a negative view of homosexuality. In short, you are also wildly overgeneralizing from personal experience. To call the followers of Mizrachi “violent people” is unwise (especially since most are not violent). I would advise to not include that in part of the description since it will invalidate your valid criticism, in the present and future, in the eyes of Mizrachi and his followers. Could we compare the number of secular people who became Shomer Shabbos having listened to R'Mizrachi vs those who read this blog or the books of its author? Ends justify the means? Might makes right? Please go ahead and make the comparison. Do you actually believe the grotesque and self-serving claims that Mizrachi has made hundreds of thousands of Baalei Teshuvah without any proof whatsoever? It is all a nonsense. Have you been to his 'Yeshivah'? Does it even exist? I once heard a claim that one yeshiva's approach was more valid than Yeshiva University's because it has far more students. Someone wrote a reply...."well, last year 2 million people made the Hajj to Mecca...you had better convert to Islam!". I do not know about whom he was referring but Abraham Lincoln once said, "I do not like that man; I have to get to know him better." Nowadays, every respectable cult leader needs a posse---to get that respect. The only place I ever hear or read about this rabbi Yosef Mizrachi is this website. I gather he may have some adherents, but clearly they are not your target audience. In short, I don't why you bother with him. Just ignore him. FWIW, he has 12K+ youtube subscribers. As to whether these posts move the ball forward, I don't know. This is not my favorite. Excellent chicken article. 2 minor points. (1)You say (page 13) the netziv would permit breakel and all chicken breeds. However the netziv permits turkey based on wide spread acceptance and the breakel has not been widely accepted. (2) You say many others follow the shulchan oruch and rema in their adoption of rashi's stringency that a mesorah is needed to permit a new type of bird. Is there an implication that those who permit turkey/cochin have to disregard shulchan oruch, ? but as you say not all those who permit turkey/cochins say they are disregarding the shulchan oruch, there are those who say the shulchan oruch would agree that turkey/cochin is permited because of hybridization or long term observation. so really there 3 categories when it comes to turkey/cochin. (1)those who permit despite rema,(2) those who permit and interpret the rema as permitting and (3)Those who forbid and interpret the rema as forbidding. I need to reread the article, but it certainly has been widely accepted that all breeds of chicken are kosher even though they differ from those in the past (at least ones that look chickens to the untrained eye). The Braekel thing is new (going both ways). silkie chicken is widely accepted as kosher ? These comments were posted to the wrong post. I am re-posting them to the correct post. I think the most important, and, I might add, obvious question here is - WHERE CAN ONE GET A T-SHIRT WITH A PICTURE OF YOU ON IT??? I am an ardent fan of this blog. I am an ardent fan of R' Mizrachi. I think the problem is most people who object to him only listen to snippets of his talks. Listen to a few hours of his talks and you will find him very mainstream but politically incorrect. He also relies on Kabbala a lot, which I find distressing, but is mainstream. In short, he is mainstream, funny, and very effective. He does, sometimes, say ridiculous things but usually admits mistakes and corrects them is subsequent talks. A rare quality he shares with R' Slifkin. Why in the world is the concept of how many people a Rabbi inspired to make Shabbos observant a standard for a rabbi's legitimacy? If the reason the person keeps Shabbos is no different than the reason Jews danced around the eigel hazahav, why is their keeping Shabbos a good thing? Mizrachi inspires people based on a dogmatic approach of superiority and ownership of truth. If someone thinks they have a full understanding of a Torah concept, they are no different than one who says eileh elikecha Yisrael. 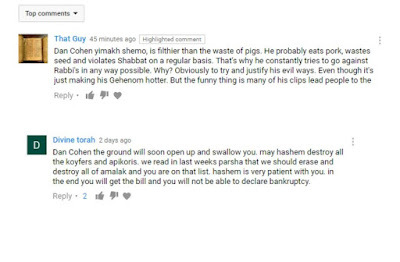 I read some of your posts concerning rav mizrahi. It seems that you doesn't know his material enough. I use to listen to his teachings, sometimes he s pretty rational.he even sometimes agrees with you. I learned from him that we don't consider every information of Talmud at the same level.for instance what is considered medieval scientific knowledge we are not supposed to follow and it can even be wrong......i m telling this because both of you have great knowledge in Torah and sometimes it s disappointing that you spend more time attacking each other often based in false information. Was the "Charedi Day Of Rage" Charedi?